CHOLLEY SA is a Swiss skincare company specializing in the production of high-quality phyto cosmetics since 1972. Our proprietary laboratories in Tessin, Switzerland, conduct an independent research and development with very exclusive formulations. CHOLLEY is making a major impact on the cosmetic industry, by bringing its new exclusive IC-RAMP® and PHYTOBIOTECH Technologies to the world market. 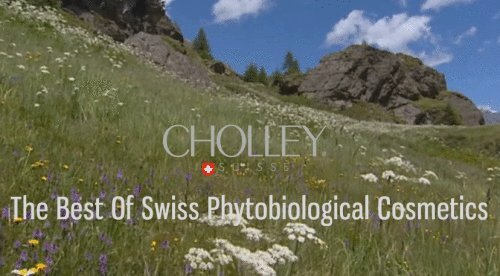 These are based on the latest innovations in biochemistry and cosmetic science, therefore placing CHOLLEY at the forefront of Swiss Phyto Stem Cell and Anti-Glycation Technologies, and is the driving force behind the High Quality CHOLLEY PHYTOCELL and PHYTOBIOTECH Products, that deliver superior and unsurpassed results. They deliver the very best, for the health, protection and beauty of your skin, with uncompromising commitment in delivering Swiss excellence and quality. Phyto cosmetics is a scientific art. It requires a thorough knowledge of dermatology, chemistry, and biology. A definition of phyto cosmetics would be this: ‘a special sector of the cosmetics industry which draws on modern science and empirical knowledge of properties of plants to produce cosmetic products with desired effects’. CHOLLEY Swiss cosmetics are the result of the empirical science of phyto cosmetics, with the latest advances in biology, molecular chemistry, and nanotechnology. Classic Phytocosmetics united with the latest advances in Swiss biology and advanced technology, to offer the most effective products possible: this is the primary pillar in the development of the Best Swiss Anti Aging Products. In very general terms, phyto cosmetics are cosmetic products whose principal active ingredients are derived from plants as opposed to being produced synthetically. Phyto cosmetics owe a great debt to popular and empirical medicine, which over thousands of years, through the crude technique of trial and error, has identified the beneficial properties of innumerable plants. Today, equipped with our knowledge of chemistry and biology, we know the scientific foundation of these properties to maximize the efficacy of CHOLLEY Swiss skincare. CHOLLEY is considered a unique Swiss company with tremendous expertise in the field of Swiss anti aging skin care and skin lightening cream. Selecting the right ingredients for a cosmetic product is a matter of art as well as science. There are numerous technical and commercial issues to consider, in order to develop effective and successful phyto biocosmetic products, that bear our logo. The type of skin for which the product is intended. Comfort of use a few hours after application. Perfume of the product, which should be pleasant but not heavy. Correct size, packaging, and price for the product. In the development of every CHOLLEY Product, each of these factors plays an important role. CHOLLEY’s objective is to deliver well-balanced products that give optimal results in short- and long-term periods, without compromising the health and integrity of your skin.